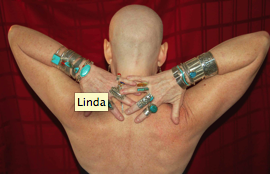 Our client and extremely inspiring friend, Linda, has just finished her chemo treatments. She has been extremely gracious in sharing her thoughts about the process. 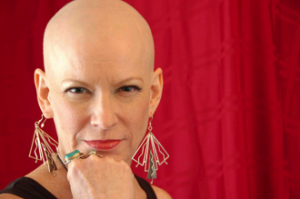 In fact, when she found out about the cancer (round number 2, by the way) her words were a lot more poignant than ‘poop’. She got through the surgery. Had to stop working as a NIC-U nurse and spent the next 5 months recovering and doing the whole chemo thing. After each chemotherapy treatment she was in our little Pilates studio smiling, crying, sharing, laughing and, of course, doing Pilates. There was one time after her surgery that she just came in to sit with us and keep us company but even then I’m pretty sure that a little bird told me that she was moving around a little more than she should have been. Later, during chemo, she was extremely sensitive to being too warm so we turned the air down to one degree over freezing to keep her comfortable. There were days when she sat on the floor waiting for ‘ICK’ to pass and even one day spent in the bathroom. But overall, I really can’t believe what she was capable of. 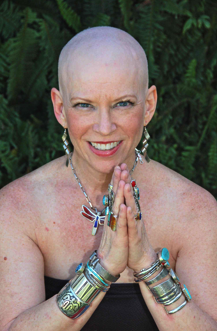 Now granted, few people are as physically adept as Linda anyway, but really, to go through chemo treatment and to still be able to do basically her normal workout. jeeeeeeshhh…. A show of Chris Tanner’s fine art photography is hanging in Pilates Teck. The show is called ‘Linda’ and features our Little Linda. Special thanks to Chris and Linda for doing this show for us and for everyone who needs that extra inspiration.